If your question is not addressed below, please contact us through our feedback form and we’ll get back to you shortly. What are sub-accounts and how can I avail it? How do I create and update my sub-account? How do I manage all my sub-accounts? Can I create multiple sub-accounts using the same email address? Can I view the data stored in my sub-accounts? What happens if a sub-account exceeds the backup quota allotted to it? What happens when I cancel a sub-account? If I cancel my main account, what will happen to my sub-accounts? 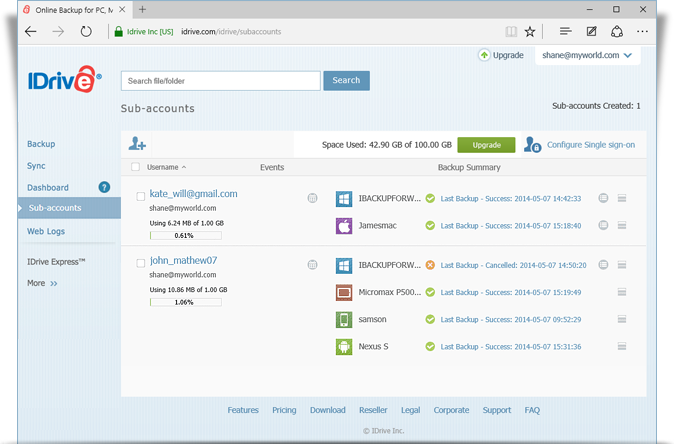 A sub-account is just like a regular IDrive account that you can create using your online storage space. 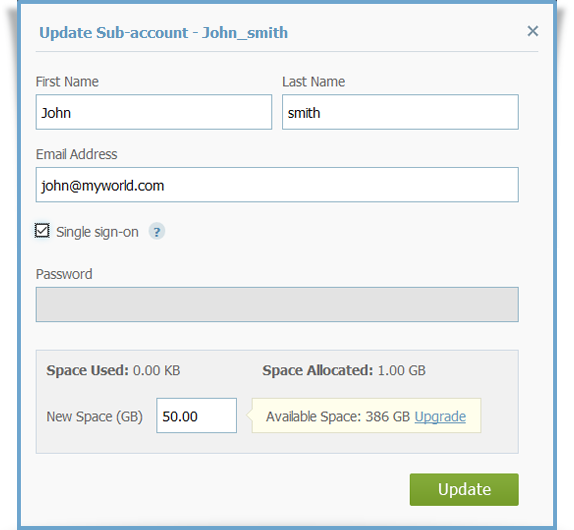 Business users can create unlimited sub-accounts for associates or business departments to backup data. The first 10 sub-accounts are free. An annual fee of $20 will be charged per additional sub-account. You can create and update your sub-accounts by logging into your account from any web browser. Select the 'Sub-accounts' tab on the Navigation pane. Click , fill out the 'Create Sub-account' form. From the Sub-accounts tab, choose the Username of the sub-account to be updated. Edit the information as required and click 'Update'. You can manage all your sub-accounts from the 'Sub-accounts' tab in your IDrive account. Track events - browser based activities like login / logout activities, file and folder operations like upload, download, etc, by clicking . View summary of backup jobs performed for the last 7 days on all the linked computers by clicking . View storage details for linked computers or mobile devices by clicking . The total size of the files/folders and the total number of files backed up from that device are displayed. Cancel a sub-account by selecting it and clicking . Yes. When you try to create multiple sub-accounts using the same email address, you'll be prompted to enter a unique username to identify among your accounts. No. To view a particular sub-account's data, you will have to login using its email/username and password. The backups of the sub-accounts will continue as normal, even if the backup quota allocated to it exceeds. The nominal overuse charges will apply only when the main account quota exceeds. When you cancel a sub-account, all the associated files will be permanently deleted. 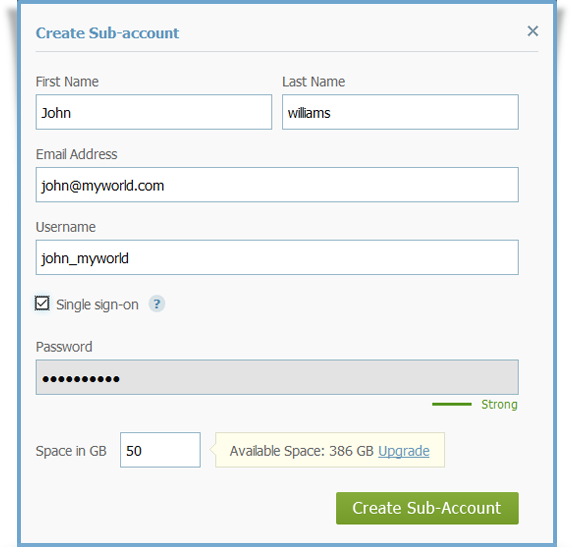 The sub-account user will no longer be able to access or backup data to that account. Your sub-accounts exist within your account. So if you cancel your account, then your sub-accounts will also get cancelled. All the files and folders in your main account and sub-accounts will be deleted permanently.